Everybody loves to get fresh flowers. This prize would allow you to pick out what you want to send. Its so fun to pick things out for people we love! 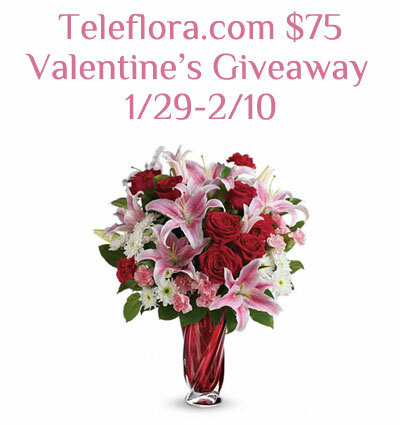 This Valentine’s Day Telefflora is the place to order flowers online. Choose from their wide selection of Valentine’s bouquets delivered by local florists to your beloved’s home or business. Use this Teleflora coupon code and get 20% off your order FLOWERS9U . Wow — that’s a tough one. I’m torn between Heartfelt and Be My Love — with about a dozen others close behind!!! True Romance Bouquet with Red Roses. I Love the Love’s Divine Bouquet – Long Stemmed Roses.